Google+ Hangout with Aaron Rodgers! Quick awesome sidenote, Google Hangouts just recently rolled into GMail, so if you have a GMail account, you can start and participate in a Hangout with others. Brief video here explains. 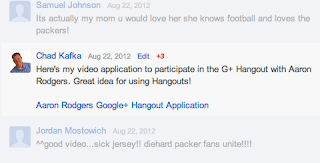 On Friday (Aug 24), I received a Google+ message from the Packers account saying I was "in consideration" for the Hangout with Aaron Rodgers and to email an Packers.com employee account with some information about myself. On Sunday (Aug 26), I received another email asking to connect over Hangout later that day to check and test settings for the Tuesday Hangout. Met online with Duke from the Packers organization to go over logistics and he told me I was one of 25 to be picked for the 5 seats and I would know more in the next 24 hours. On Monday (Aug 27), I was leading a tech training in my district and didn't get to check email until around 11:30, but when I did, there was an email saying I was one of the 5 finalists! 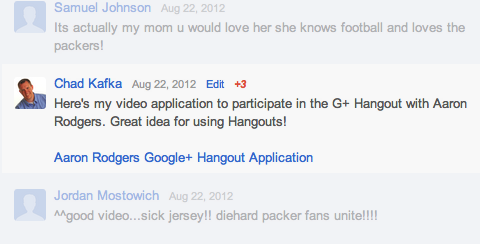 That means I was picked to "Hang Out" with Aaron Rodgers on Tues, Aug 28 @ 2pm CT! The Hangout was streamed live (through a cool feature called Hangouts on Air) and I made sure to OVER share the link through my Twitter account, Google+ and Facebook! The 'learner/technology geek' side of me wants to take a step back for a second and look at this. How cool is this from a technology and personal standpoint? More and more, we get to connect virtually online with others. I'm finding myself doing this all the time. How can we teach this to and impart this on our students to do things like this? To reach out to others through the internets and make a connection? I meant what I said in my video -- I want to showcase things like this to others so they can think, "How can I do that? How can I connect with an author of my children's stories? How can I connect with an engineer around a topic we are learning about? How can we connect more?" The technology is there. How are you as an educator going to use it? What a humbling and surreal experience. It was pointed out to me by many that I was the 'oldest' one in the Hangout. Awesome. I was impressed with how conversational Aaron was. Very down to earth. Just wanted to talk. We were only supposed to go 15 minutes but he hung out with us longer and the total show ran 30 minutes. It was great to hear his responses and thoughts related to being a role model, how he learns something new and social media. The educator part of me is excited to hopefully use clips from this where he talks about NFL players using Twitter inappropriately or just being aware that pictures can be taken of you at any time. Some good content there. The fan part of me was really just overall impressed with how he carries himself. Thanks to all for the kind thoughts, jokes, questions, and congratulations. Was a great time and I'm glad I was able to share it with so many.